There were a few others that I voted for too, but I'm keeping that information to myself. There was a surprisingly low turnout at the poll that I went to today. There's been light rain since this morning. Two years ago when I ran for Board of Education, there was a heavy, steady drizzle and the polls were packed! But I've also heard that there was gobs of early voting this year: far more than there had been in previous elections. So once again, I've done my civic duty by casting an informed and enlightened - as best I can muster anyway - ballot. I also voted for Chuck Baldwin. Kudos to you for thinking for yourself, Chris! 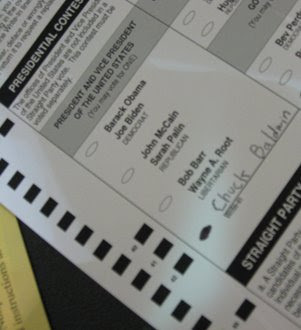 I didn't have to write him in as he was printed on the Missouri ballots. I voted for Barack Obama a week and a half ago. Kudos to NC for early voting. It allowed to watch the results from my mom's house in the Roanoke, Va., area. A friend of mine in Radford, Va., a town of only 25,000 (where my alma mater Radford University is) waited in line for two hours today!